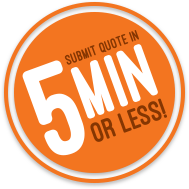 Quality has long been Doug Palmberg's area of expertise and the focus of his career, long before he came to PMI LLC in Bloomer 12 years ago as quality manager. But as he grew into a larger leadership position at PMI, he found different sets of skills were called for as his role expanded. Fortunately, he had a good coach to help him along and keep him on track. "PMI experienced a tremendous growth spurt during my time here," said Palmberg, who is now research and development technology manager. "It was hard for the leadership team to keep up with all that was going on. There were some communication problems and kind of a disconnect with management."
One of the tools Burns uses in leadership training is the Gallup StrengthsFinder®, an assessment based on series of questions that help identify key talents of individuals. One of Palmberg's talents, for example, is being deeply analytical a good quality to have for a quality manager. "Coaching is not mentoring, and it's not telling people what they should do," Burns said. "And it's not consulting or teaching. Coaching is helping the leader discover their own solutions to challenges and discovering opportunities to develop as a leader." Burns noted that topics for coaching sessions are determined by the person being coached. to agree on action items and review results throughout the coaching process. "Coaching is very results-oriented and outcome-focused," Burns said. "We have really made some big steps in establishing a positive culture," Richardson said. "We're very open about what we're doing and the reasons why and the employees want to know why." 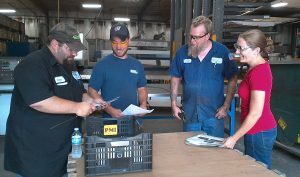 Shown Above: At PMI in Bloomer, from left, shipping manager Denny Bischel, fabrication and soft tool manager Jesse Roettger, laser operator Jesse Roettger and quality technician Holly Poore discuss production issues. The management and leadership teams at PMI obtained leadership training and coaching through CVTC, enabling them to improve communication by better understanding the talents of the people involved.